Glyn High-Tech Distribution presents the new Telit GE865 breakout board that facilitates an easy and low cost way to connect Arduino, Propeller or any microcontroller to the Internet via the 2G GSM/GPRS phone network. 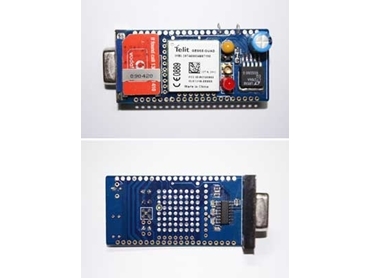 The new WT25_GE865 breakout boards allow users to send or receive text messages from their Arduino or send emails and retrieve information from the web without a wired connection. WT25_GE865 breakout boards available through Glyn enable easy connection of microcontrollers to the Internet over the 2G GSM/GPRS network. The WT25_GE865 ultra thin PCB lets the user connect Telit’s low cost 2G GSM/GPRS module, the GE865 normally used only by high volume surface mount assemblers. Using a fine tip soldering iron, the solder balls of the GE865 can be soldered from behind the thin printed circuit board easily. The ball pitch on the GE865 is 2.4mm, just slightly less than 0.1" DIP or SIL components.